The new 2019 Gravity Liberty CXD is just the bike for the rider wanting the performance of an aluminum frame, wide gearing, comfortable riding position and dealing with a budget. 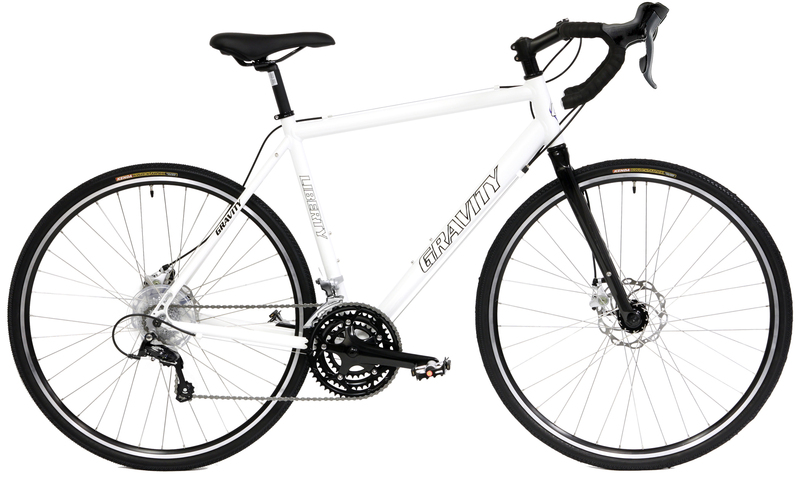 The Liberty frame is precision welded from specially shaped lightweight and strong aluminum tubing. The tubing is Gravity's own special CXSeries tube-set. Look at the engineered top tube and bi-oval downtube. This is designed for a responsive performance while maintaining a comfortable ride quality. The frame is a semi-compact geometry which allows for a bit more comfortable and upright position and easy straddling. Yet is still aero-enough for some serious riding. Powerful disc brakes and rear rack mounts make this the perfect commuter. Compare this bike to the Trek, Giant, Specialized disc brake cross and road bikes that sell for $1200 plus tax. Most have straight blade forks and aluminum frames, many have semi-compact frames. Many other bikes have only 16 gears, the Liberty has a much wider range with 24 gears. Trek, Giant and Specialized cyclocross or road bikes with similar specs sell for $1200 range. A. J. "I do love this bike and it rides real well…The original shifters worked well and the drops were nice...around 500 miles on this bike and it (rode) pretty good for the money. Why spend thousands when you can get a quality bike for cheap." T. S. "...most of the CX options with disc brakes available from the big manufacturers were beyond what I wanted to spend ($1200+)….so I turned to the internets(!) and discovered bikesdirect.com.…it came about 90% ready. I had to put the front wheel and handlebars on, I had to air up the tires, put the pedals on, and adjust some things (brakes, seat, shifters, derailers). But bikes are easy, I mean, if you can handle wrenching on your go kart, you can handle a bicycle. I was up and riding within 30 minutes…. Since this bike is so well rounded, I can run errands with it during the week, commute to work on it, and take off some unnecessary bits for a long ride on the weekend. It’s almost like fitness disguised as fun, because riding a bike can be a hell of a cardio workout, and it’s much more fun than staring at the back of a Kia on your morning commute." P.H. "I absolutely could not find a road bike for sale on Craigslist for anything less than $600 unless it was 15+ years old or singlespeed. At that point, I am buying the same technology as what the Gravity CXD has being brand new...The Nashbar CX bike is probably the cheapest fat-tire road bike, and it was still $250 MORE than the Gravity, and both utilize Sora components…$800 would get me a Nashbar Tourer with Sora 10spd, but that bike weighs close to 30lbs." 4' 11 up to 5' 2"
5' 7" up to 5' 10"
6' 0" up to 6' 7"